We take the guessing out of booking a vacation rental home; our calendar is ALWAYS up-to-date! 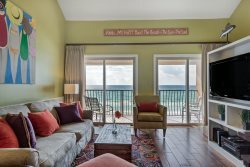 If this one is booked, be sure to check our other condo in Coral Reef Club, see the "Coral Reef 2" property on our website. Coral Reef Club is one of Destin's best kept secrets. Located on Scenic Gulf Drive, next to the Henderson Park Inn. It’s a low-density, family-friendly resort (only 3 stories which means fewer people on the beach!) Our large 3rd floor condo is a great place for your family to use alone or to share with friends. It is open and airy with vaulted ceilings in the living room and expansive views from the kitchen and living areas. And if you [unfortunately] have to work while away, there is a dedicated cat-5 line internet connection to rapidly VPN into your work’s servers which minimizes the time you have to spend working. And of course, for all your i-thingys there is also dedicated wifi (the rest of Coral Reef is on a public wifi network). Even if you don’t like to cook, you’ll discover your inner Emeril Lagasse or Julia Child in our dream kitchen. You’ll love cooking using our Calphalon Professional Cookware. We, of course, have equipped the kitchen with all the necessities such as a dishwasher, toaster, microwave, ice-maker, blender, ample plates, glasses and kitchen utensils. You'll also find a Keurig K-cup coffee maker, as well as a regular drip model. For your convenience, we supply many “extras” such as cleaning products, trash bags, aluminum foil, plastic wrap, sugar, creamer and spices. The Dining area features a table with 4 dining chairs and a bench (seats 6-7) . For the wee little ones we have a high chair. The Master suite has a King size bed with Egyptian cotton sheets, night stands, reading lamps, large dresser, large closet and HDTV. The window has room darkening drapes (so you can sleep in or take an afternoon nap while on your vacation). The attached full bathroom features a commode, vanity with sink, and a shared Jack-and-Jill style shower room with a tub/shower combination unit. The bathroom is equipped with a hair dryer and large fluffy bath towels, iron and ironing board. The 2nd floor fully-enclosed loft bedroom has a King-size bed, with Egyptian cotton sheets, night stands, reading lamps, chest of drawers, closet and HDTV. This bedroom shares an attached Jack-and-Jill style bathroom which features a vanity with sink, tub/shower combination, hair dryer and large fluffy bath towels. The 2nd floor fully-enclosed loft bedroom has 2 Queen-size beds, with Egyptian cotton sheets, night stands, reading lamps, chest of drawers, and closet. There is an HDTV with internet capability so you can use easily use your Nextflix or Hulu accounts to watch your favorite programs. This bedroom shares an attached Jack-and-Jill style bathroom which features a vanity with sink, tub/shower combination, hair dryer and large fluffy bath towels. For your convenience, we also have a washer and dryer, and two irons and full-size ironing boards (one on each floor). And if you would like to keep up with friends, family or work while you are away, we provide free high-speed internet and WiFi.